This story is the back story to my last post… the story of the day I met Monica and Doreen. 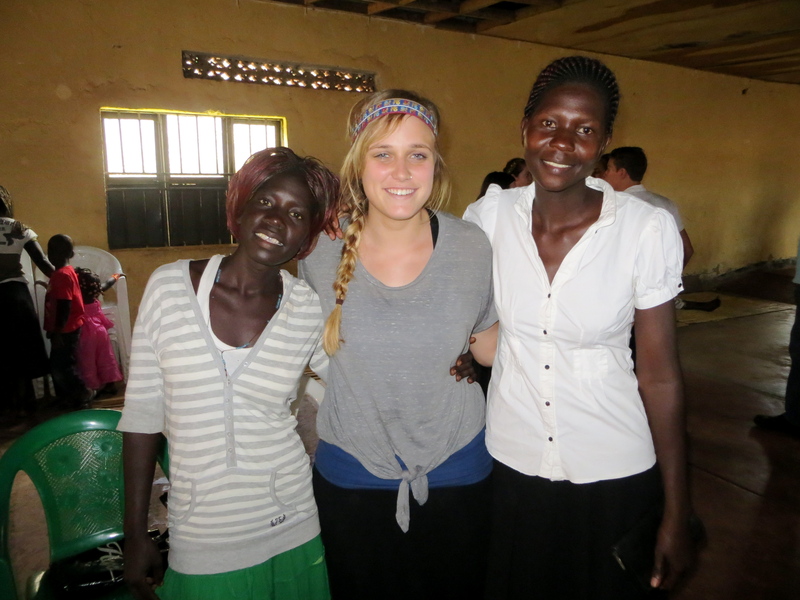 We sat in our team meeting on our fourth morning in Gulu, all teaming up in pairs to go out for the day. Joanna needed someone to come with her to do a discipleship lesson with the two women she had led to Jesus the previous day, so I went with her. Joanna and I walked to the market where they work, talking through the lesson we were going to do and praying that God would somehow take our measly words and speak to our new friends. We sat down in their tiny shop where they both spent most of their days sitting at a sewing machine. The shop was about half the size of the dining room I’m currently sitting in at my house as I write this, and it was just a hop and a skip from the fish market, so the smell coming through the 90 degree heat was as wonderful as you can imagine, I promise. And you know, when you’re the only white westerner within a two mile radius, there just isn’t a natural sort of feeling going into the situation. You try to act normal but the reality is that it’s uncomfortable and there’s language barriers and cultural chasms standing between you and everyone else. It’s like a wedgie for your emotions. Somehow, though, hungry hearts bridge the gap and these women hang on every word we say, because they’re desperate for the hope and joy we claim to have in this Jesus they just met. And I felt the fear of God in a new way, knowing that it would have to be Him and not me that came in to change these new friends’ lives. Well, we kind of stumbled through the lesson for the first half. Joanna and I kept passing it back and forth as one of us would get frustrated with the language barrier, coming to the end of our internal thesaurus capacity, and hoping the other would have some other word to use that they would understand. The lesson was on prayer and there’s a place in the middle where someone is supposed to share a story of God answering a prayer in their life. Joanna shared a story about a family member who was far from God, and how years of praying led to that family member finally turning back to Jesus. All of a sudden, there was a shift. It was more than a shift, actually. It wasn’t just a subtle, “wait a minute, this feels different.” Barriers were breaking and walls were falling, and you could feel it — it was powerful and I could almost swear that I felt the earth shake in that moment. Suddenly we were just four broken women clinging to a God who heals and restores. Masks had come off and barricades had departed. Joanna’s vulnerability in sharing a story opened a door for breakthrough, and it was like we all joined hands and busted right through the wall together. Monica and Doreen shared deep things they were believing God for. Things I’d believed for too, like broken relationships and families. And with tears in our eyes we prayed together to see God deliver our friends and families. Four women with the same heart, no longer separated by language or culture, but united for the sake of His kingdom come. This is the power of vulnerability. It’s the power of testimony. When God moves, we tell about it, and it stirs faith in others to believe that He could do the same for them. Stories of His faithfulness bind us together, and even weeks later and on the other side of the world, a part of me remains in that tiny shop in Gulu town. And I wonder, how unified would we be if sharing deep stories of the healing and restoring power of Jesus became our normal? ← There’s a lot of life out there.